During an eye examination, the pupil may be dilated using eye drops. This helps to give a better view of the retina at the back of the eye. After pupil dilation, the eyes may be blurry for a few hours. Driving should not be undertaken while the eyes are still dilated. Retinal photographs are commonly used for eye examinations. They provide a detailed image of the retina and a basis for comparison for future eye examinations. If the ophthalmologist suspects wet macular degeneration, a fluorescein angiogram will generally be used. Fluorescein dye is injected into the blood through a vein in the arm. The dye rapidly reaches the eye, and circulates through the retina to highlight any abnormalities or blood vessel damage. A camera with a special filter then takes a series of photographs. The procedure takes just a few minutes. An optical coherence tomography – or OCT – scan is now a standard procedure in the diagnosis and ongoing management of wet macular degeneration. An OCT scan is a non-invasive imaging technique that uses light to produce very high-resolution cross-sectional images of the tissue layers within the retina at the back of the eye. 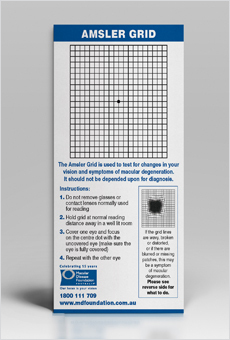 In between tests by an eye health professional, you should regularly check for changes to your vision using an Amsler grid. You can order your free macular degeneration information kit, which includes an Amsler grid from Macular Disease Foundation Australia here, or call the Foundation's free Helpline: 1800 111 709.